The seminar was delivered by Alan, seen here in the photo reviving dummy Annie, a retired first aid trainer and now a volunteer with the Community Heartbeat Trust. Alan had the knack of holding the audience's attention by expecting an answer to his questions from every person in the room, so there was no falling asleep on this seminar! 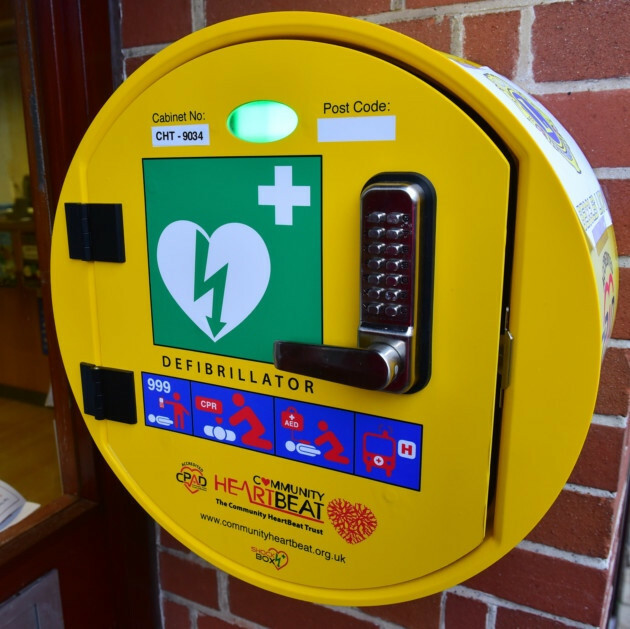 The main town centre is now very well covered with three 24 hour accessible defibrillators on the Cinema, the Fire Station and the Police Station in the park. It's amazing how few people knew about all three of these at the start of the seminar though, so please spread the word of where they are to all your family and friends, as this knowledge could well save a life! The Marple Town Centre Defibrillator has now been installed. We'd like to send a big thank you to electrician Mike Beese of TBG INSPECTION SERVICES (pictured below) for providing installation support to the Marple Town Centre Defibrillator Project. The Defibrillator is now registered with the NW Ambulance Services and "Live" in service. A call to NWAS on 999 will get you the access codes if they agree that you need to use it. After protracted discussions with a variety of local businesses and landlords we are delighted to report that a location for the new Marple Town Centre Defibrillator has at last been agreed and it will shortly be installed on the front of the Regent Cinema. It's been a lengthy process to find the most suitable location – much longer than it took to raise the money thanks to some very generous local people - but after considering potential sites between Rose Hill and Possett Bridge, and drawing lots of circles on maps, we've chosen the most prominent location that satisfied all the requirements. We'd like to say a very big thank you to the owners of the Regent, who have been very positive and quick to support the project. We look forward to having a little celebration once the defibrillator is installed and commissioned to thank everyone who has supported the Appeal. Other recent news is that the scheme operated by estate agent Julian Wadden enabling sellers to donate a proportion of the commission on the sale of their properties to the defibrillator's maintenance has provided its first contribution of £122. This will cover maintenance costs well into a second year. You can read more below about how the defibrillator project was funded by donations from Marple Area Committee, Stephanie Lorusso (of Malcolm Shaw & Son), GT Landscapes and Construction, Marple Civic Society, the Marple Website, Shop Local Club Card and Julian Wadden. A truly local Community Project! Marple Bridge Association Chairman Phil Cooke is a man on a mission who, after achieving the installation of life-saving defibrillators in Marple Bridge and Compstall, turned his attention to Marple Town Centre. Working with Marple Civic Society, in November 2017, Phil secured £1,000 of the £2,000 worth of funding needed for this from Marple Area Committee. Marple Civic Society also pledged £200 towards the up-front costs and undertook to pay the £126 annual running costs for the defibrillator too. Local business GT Landscape and Construction Ltd was the next to get involved and pledged £100 towards the project and The Marple Website also pledged £50 and agreed to help with campaigning, which meant that there was only £650 to find. Soon after the appeal was launched on The Marple Website it was spotted by local lady Stephanie Lorusso (nee Shaw, of the Malcolm Shaw & Son Funeral Directors family). Stephanie generously donated the balance of £650 that was needed to purchase a defibrillator for Marple Town Centre. She said that her mother (Sheila Shaw) had a Cardiac Arrest a couple of years back on 2nd January, which she fortunately survived. Sheila then had to have a triple heart bypass last year, which went well, and she is back dancing and living a very active life now at the age of 80 years next September. When Stephanie saw the Defibrillator Appeal on-line she said she had to contact us and do something as she had been thinking about buying or contributing to a defibrillator in the town centre already and this was the perfect opportunity. Having reached the target of £2,000, it was decided to continue the Appeal to try and cover at least some of the ongoing maintenance costs of £126 PA. Although Marple Civic Society had pledged to pay for this, and of course will do so, if we could raise some extra money towards it then the society would be able to conserve their existing funds and do other things to benefit Marple with them. Soon after the owners of Shop Local Club Card donated £50 towards the annual maintenance costs. Soon after that extra support came from local Estate Agent Julian Wadden. They operate a scheme where 5% of commission on sales is donated to a fund that helps to purchase life-saving defibrillators for use in and around the local area. The seller is asked to choose who should receive the donation from the sale of their property, selecting from a list of pre-approved local beneficiaries. JW agreed to add the Marple Town Centre Defibrillator Appeal Maintenance to their list of approved beneficiaries that sellers can choose from, up to a maximum value of £630, which is equivalent to 5 years of maintenance at £126 PA. This was a fantastic offer for the Town Centre Defibrillator Appeal because contributions will boost Marple Civic Society's undertaking to pay for the maintenance and allow them to spend any funds they save on other important local projects. The Appeal Team would like to thank Marple Area Committee, Marple Civic Society, GT Landscapes and Construction, The Marple Website, Stephanie Lorusso, Shop Local Club Card and Julian Wadden for their fantastic support of the Town Centre Defibrillator Project, which is due to be installed on the front of the Regent Cinema in the near future. Maintenance costs: £126PA (will be covered by Julian Wadden / Marple Civic Society). The Town Centre Defibrillator will be available 24 Hours a Day once installed.